If you fancy seeing the river from a different angle, why not try canoeing or kayaking? Recently we packed my son and his cousin off on a “tour” run by Mosel Kanu Tours. With stations at Ernst and at Ediger-Eller, they offer several options for getting you afloat. You can either rent a vessel and make your own arrangements to get it back to the starting point. Or, you can opt to do a “tour” which includes transporting you and all your kit back at a pre-determined time. It’s not a tour in the real sense though, and you are not accompanied by an instructor or tour guide – you make your own way downstream and at your own pace so you can make up your own itinerary as you go along. The company provides buoyancy aids and floating waterproof containers to store your keys, phone, sun cream, etc. Liability insurance is also included in the price. A choice of boats is available – kayaks, Canadian canoes and those stand up board things that seem to be the rage now. The kayaks can accommodate one or two paddlers and the canoes three and four. 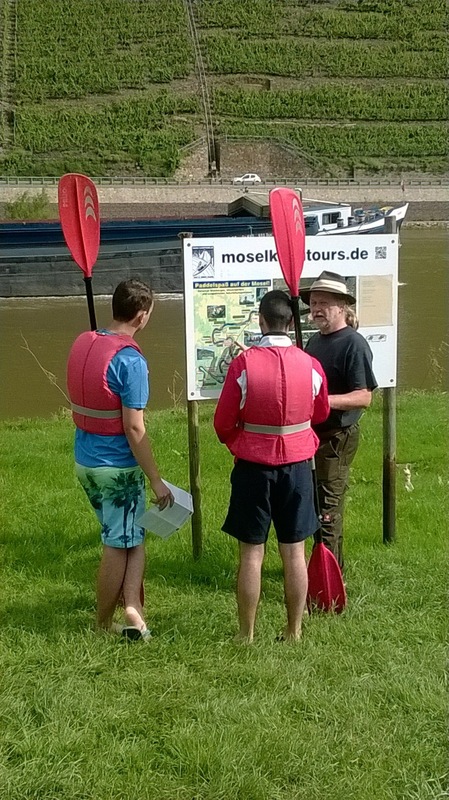 For more information on Mosel Kanu Tours, click here. Oh, they also do bicycle hire, and you can combine that with boating for the ultimate experience.